Description: Designed with a round profile and a distinctive architectural look, this versatile two-tier pendant defines a sophisticated aesthetic. The lower White Textrene shade features a Statuario Idalight bottom diffuser with a Crystal finial and enhances a larger White Textrene shade. The twin-shade pendant is complemented with hardware featured in a Nickel finish and illuminated with eight medium base 60-watt bulbs. 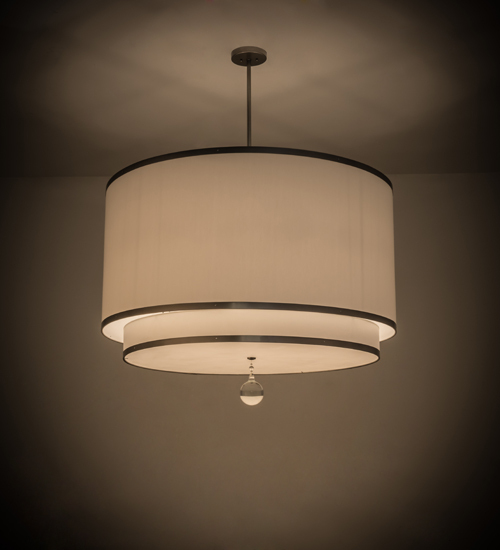 Handcrafted in our 180,000 square foot manufacturing facility in Yorkville, New York, this transitional styled pendant is available in a wide range of custom choices including various designs, colors, sizes and dimmable lamping options such as LED. UL and cUL listed for damp and dry locations.